According to the Action Network's Darren Rovell, tickets for the ​Duke game against unranked NC State are more than $1,000 more than the top-10 matchup between No. 3 Virginia and No. 8 North Carolina. $1,139: Get-in Saturday for unranked NC State vs. #2 Duke. Lot fewer seats at Duke, but difference is insane. Granted Virginia's matchup with the Tar Heels is on a week night in a bigger venue, it's still a pretty remarkable difference in price. The No. 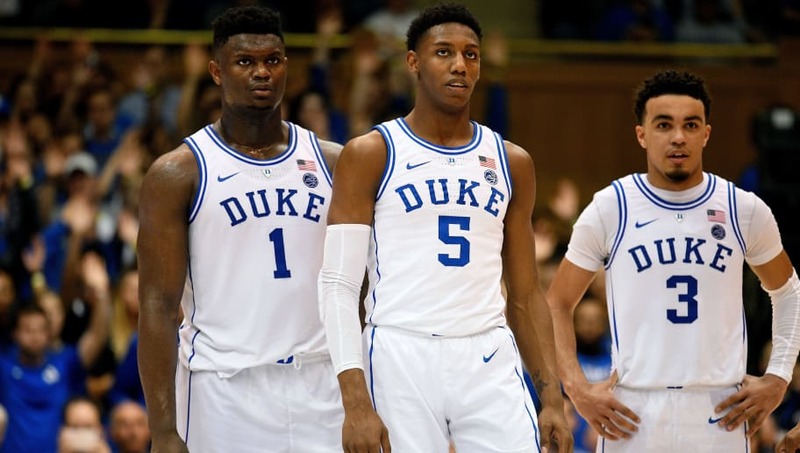 2 ranked Blue Devils (21-2, 9-1) have been the talk of college basketball this season, led by fab freshmen Zion Williamson, R.J. Barrett and Cam Reddish. Zion is must-see TV every time he takes the court with his gravity-defying dunks and volleyball spike blocks. He's in the midst of one of the best statistical seasons in NCAA history averaging nearly 22 points and nine rebounds on 68 percent shooting. Duke extended its win streak to seven games after beating​ Virginia 81-71 on Saturday night. The Blue Devils haven't lost since falling to the Syracuse Orange in OT on Jan. 14. Duke has some tough tests before we head into March Madness, with two games against the No. 8 Tar Heels and away games against two ranked opponents in the No. 16 Louisville Cardinals and No. 22 Virginia Tech.